If you’ve got thick hair and want a trendy new look, this is definitely the most fashionable short hairstyle right now. 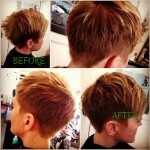 It’s heavily stack-cut at the back to create that fantastic elongated shape which moves down to a soft line at the nape. 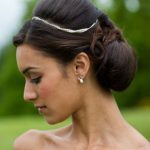 The height in this short haircut gives you the elegance of an updo, but without the fuss. The sides are sliced with a vertical layering technique that ensures all the bulk is removed from the ends. The tips are carefully textured to allow the layers to blend into the sculptured shape. To emphasise the precision cutting and create a textured surface, the hair is highlighted in two shades of golden blonde. So even though this short A-line bob hair style is ‘helmet-shaped’, there’s lots of lively movement on the surface moving the eye back to the round bouffant shape. It’s a high-fashion look with a chic and sophisticated image and no matter what colour your hair is, you can add dual highlight shades that make this short bob haircut incredibly eye-catching!